NEW YORK, October 12, 2016 /3BL Media/ - In the most comprehensive annual analysis of corporate societal engagement, CECP: The CEO Force for Good, in association with The Conference Board, found in their annual Giving in Numbers survey that the link between a company’s business strategy and their engagement with society is ever more vital, as are the people within the company leading this connection. With the growing recognition that long-term business performance is tied to social responsibility, companies are allocating bigger budgets to the community engagement team, elevating giving officer roles and responsibilities, and ensuring that both employees and customers are able to show their commitment to giving back through the brand. CECP, a coalition of more than 200 of the world’s largest companies with a combined annual revenue of more than $7 trillion, released, in association with The Conference Board, Giving in Numbers: 2016 Edition, a report on the largest societal engagement survey of 272 companies, now in its 11th year. Business performance is tied to social responsibility: Companies that increased total giving by at least 10% between 2013 and 2015 saw increases in median giving as a percentage of revenue and pre-tax profit, as opposed to all other companies that instead saw decreases in both metrics. Companies with a stronger sense of purpose also had stronger financial and Environmental, Social, and Governance (ESG) metrics. Bigger Budgets: Total giving grew slightly with nearly half (47%) of companies in a three-year matched set between 2013 and 2015 reporting an increase in median total giving—by 1%. Elevation of roles and responsibilities: With companies seeing the bottom-line benefits of adding resources to the community engagement office, corporate giving teams are not only expanding (full-time equivalent employees rose 3% from 2013 to 2015), but their prominence within the company is rising, with 29% of teams reporting closer alignment with the CEO’s office. Further, teams are being called on to share materially significant data: 56% of companies say their corporate citizenship department provided ESG information to a particular investor or the company’s investor relations department. Employees and customers seeking out new ways to give back through the company and the brand: Employee volunteer participation rate with their company’s community efforts continued to rise to 33% in 2015 from 28% in 2013. Additionally, about half of companies saw building trust with consumers and other stakeholders as a goal of their societal engagement programs. Fifty-five percent of companies used increased trust (e.g., Edelman Trust Barometer, Nielsen Global Consumer Confidence Survey, etc.) as a benchmark of success for their community investments. 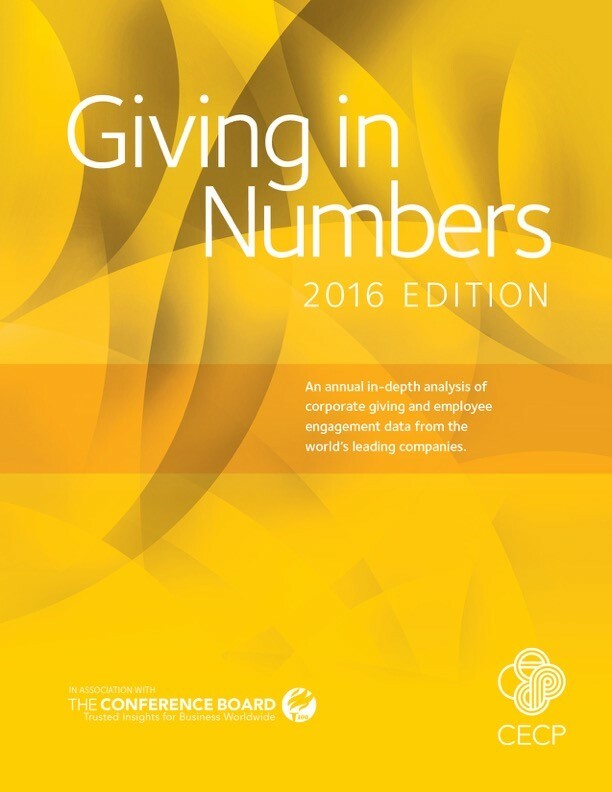 Key insights from the Giving in Numbers survey of 2015 data were released in front of an audience of 250 corporate societal engagement professionals at the CECP Summit in May 2016. Measuring societal outcomes and/or impacts became a more widespread practice: Demonstrating impact and transparency is critical for companies, and as such 87% of companies measured societal outcomes and/or impacts of at least one grant in 2015, up from 79% in 2013. Most commonly, companies focused their measurement efforts on strategic programs. Investing with purpose goes along with societal engagements: Companies that took part in impact investing supported community programs more overall. Median total giving for companies active with impact investing was more ($25.7 million) than that given by those not active in impact investing ($15 million). Watch for CECP’s forthcoming White Paper on impact investing, in partnership with Prudential. Philanthropic Leverage, a component of “good beyond giving,” is on the rise: Philanthropic Leverage, which refers to the average monetary contributions from employees and non-employees, has increased in the last three years. Philanthropic Leverage is also a component of “good beyond giving” (socially driven corporate activities that are additive to total giving). Companies with higher growth rates of total giving were also the ones with higher Philanthropic Leverage growth rates. Custom analysis of the data is available to CECP-affiliated companies at no additional cost; these companies can access data through CECP’s secure online portal or by calling CECP. 2015 data is now available online. CECP is grateful to Newman's Own Foundation, PwC US, and The Travelers Companies, Inc. for their support in making Giving in Numbers possible. Note to Editors: Carmen Perez is available for comment and a more in depth look at the community investment data collected from 272 of the world’s largest companies. CECP is a coalition of CEOs united in the belief that societal improvement is an essential measure of business performance. Founded in 1999 by Paul Newman and other business leaders, CECP has grown to a movement of 150 CEOs of the world’s largest companies across all industries. Revenues of engaged companies sum to $7 trillion annually. A nonprofit organization, CECP offers participating companies one-on-one consultation, networking events, exclusive data, media support and case studies on corporate engagement. For more information, visit http://cecp.co.